Dollhouses are a great gift for a little girl or boy and they can be very affordable and personable if you go the handmade route. However, while we do like to drool over extravagant handmade dollhouses such as this guitar dollhouse or this treehouse inspired dollhouse, some of us parents just don't have that much time on our hands or the woodworking tools required to complete a massive dollhouse project. No worries! 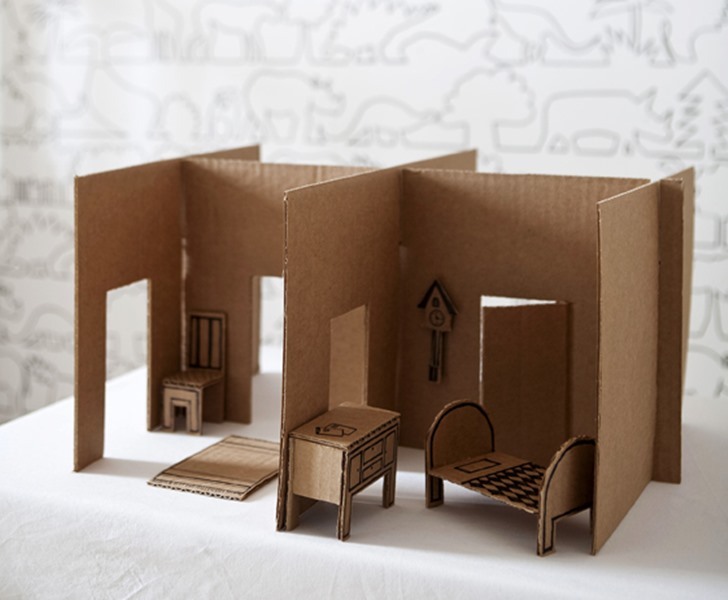 There are many simpler, yet still cool dollhouses out there that can be made with cardboard, glue, blocks and other crafty supplies you likely already have at home. 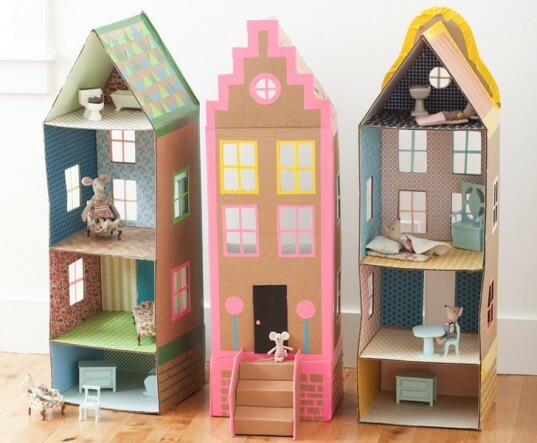 In fact many of these dollhouses are so easy to make that your little one can lend a hand! Keep reading to see a lineup of easy to make, charming and fun dollhouses for your child, then get building! This “off grid” DIY dollhouse takes the cake when it comes to sustainability, cuteness and fun! 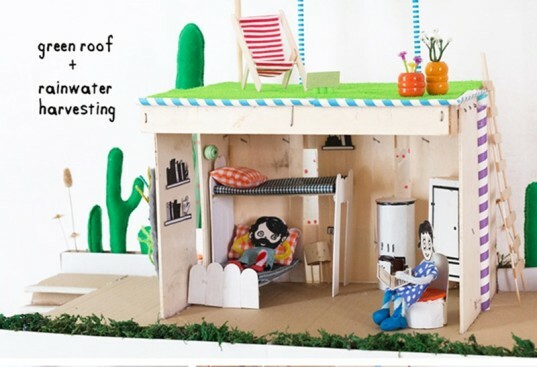 This imaginative dollhouse is made entirely with recycled and scrap materials plus teaches your kids about eco-friendly living via the creative green roof, veggie plot, radiant floor and other eco-qualities the house possesses! 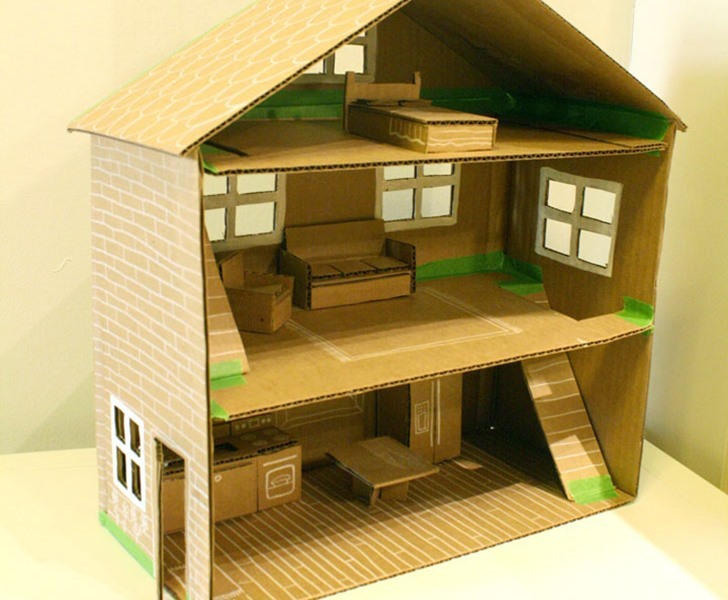 Recycled cardboard is an excellent go-to material for an inexpensive, easy-to-build dollhouse and this one, from Little Red Window is an awesome example of a basic structure you can use. Plus the step-by-step tutorial makes this project a snap. 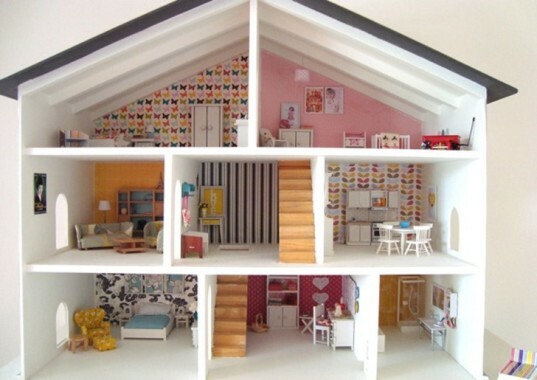 If you’re a frequent Inhabitots’ reader then this dollhouse might look familiar to you, because it’s inspired by the amazing Hase Weiss dollhouses! Eva, apparently crafter extraordinaire, constructed her own copycat Hase Weiss dollhouse, and it’s amazing! Plus, beyond looking modern and lovely, this whole dollhouse can be reconfigured in dozens of ways and stacks together for easy travel. Now, if you’re going to transform a bookshelf into a dollhouse, this one is an excellent example, because while many folks use woodworking tools to add a slanted roof to their bookcase dollhouse, this one simply sticks to a flat roof, cutting the time and skill needed to create this dollhouse. For other examples of bookshelf dollhouses, check out this sweet tutorial or this clever upcycled dollhouse. This pastel perfect tutorial shows how ordinary recycled milk cartons and other containers can be turned into an entire town of little houses. Tip: combine the cartons together with or without glue for a larger dollhouse. 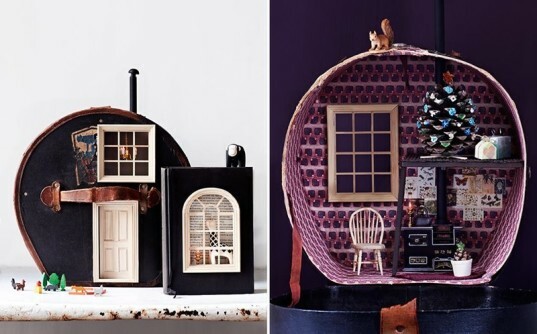 These townhouse-like CD cases turned dollhouses are adorable! According to the tutorial, you can purchase CD shelves at craft stores with windows already included, but if you can’t find those, any recycled CD holder will work, just add windows on with paint. 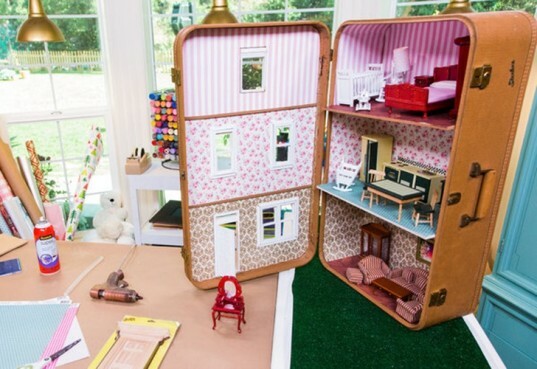 Take your old suitcase, or snag one at a thrift store, and make this super cool – and easy to transport dollhouse. If your little one is all about scary stuff, then this house is for her! First grab the FREE template from Mr. Printables, and then make this easy spooky dollhouse with wood, paper or cardboard. You also might want to check out Mr. Printables’ cool Christmas style dollhouse template. This dollhouse, made with an upcycled CD case is uber adorable and clever. Fashioned after a Plan Toys dollhouse, you seriously can’t even tell this used to be a CD holder. Got found objects? I know you do. Boxes, acorns, tiny figurines, and more can be gathered up to create a one-of-a-kind dollhouse. This adobe-like dollhouse is made of shoeboxes! What a surprise right!? However, the cool thing about this tutorial is how the crafter shows you how to reinforce the boxes so the dollhouse will last a long time and stand up to kids playtime. No one is suggesting you eat a ton of store-bought popsicles to make this house. In fact, reusable ice pop molds are WAY more eco-friendly. Still, if you happen to have extra sticks and a bit of scrap wood around, this dollhouse might be the one for your child. 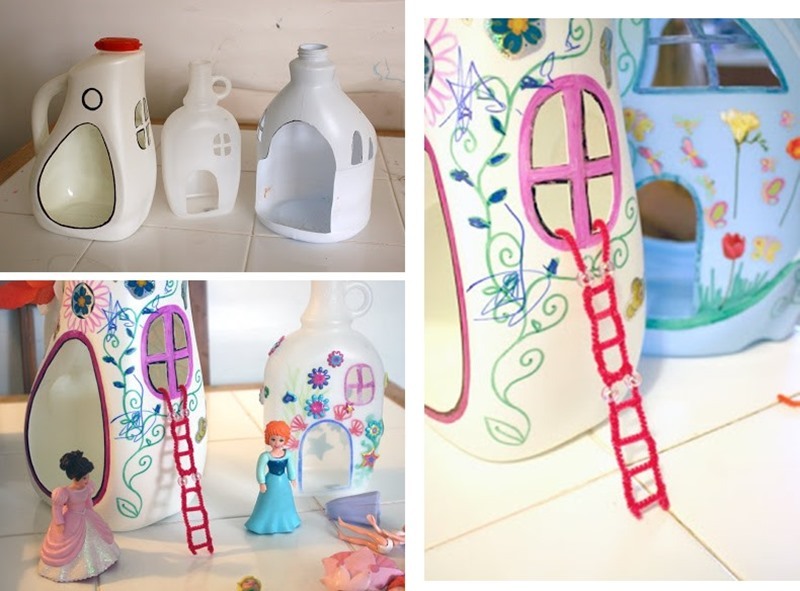 If you buy detergent in bottles, then you can wash them well, and upcycle them into the sweetest little fairy doll houses – or combine them to make one large dollhouse structure. Another fine example of a low-cost cardboard dollhouse, this tutorial shows you how some well-placed paint and wallpaper can turn a basic cardboard box into an extraordinary brownstone dollhouse. 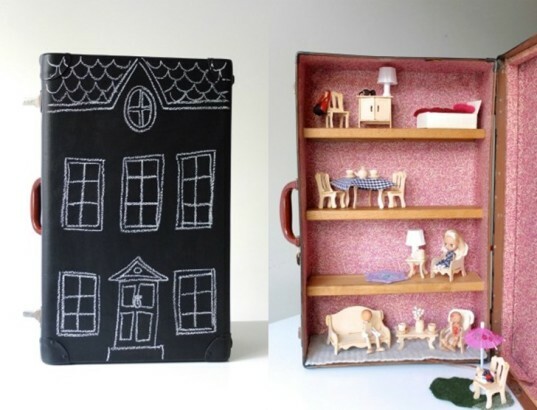 This super styling suitcase dollhouse isn’t too different than the one earlier in the slideshow, but has the added coolness of a chalkboard exterior, meaning, your child can draw all her favorite exteriors, erase, then draw again whenever the mood hits. This is one of the more advanced DIY projects in this slideshow, and to make as is, you will need some simple wood tools BUT this is only if you’d like your dollhouse to be modular and not fixed. 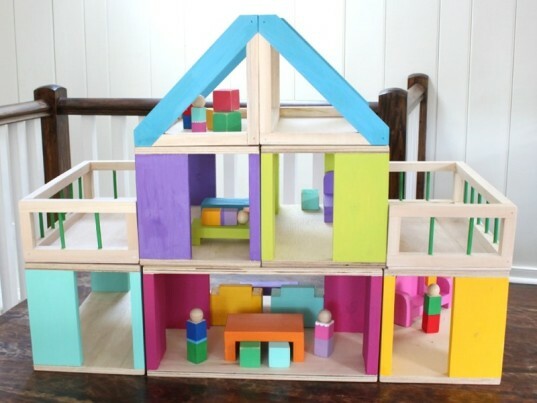 If you don’t have wood tools, this dollhouse is still an awesome example because you can paint some wooden blocks, then glue them together using the images in the tutorial for inspiration and you’ll have one really fun and solid dollhouse. This simple cardboard dollhouse is a perfectly easy parent-kid starter dollhouse project and a nice way to get a feel for if your child really wants a bigger dollhouse. If you can find an old hat box, or a small carry case, you can make this unique upcycled dollhouse. This is a super fun dollhouse for kids on the go. The tutorial is very easy to follow, showing you how to create a portable dollhouse that actually packs right up into itself! If you honestly feel like you don’t want to make a DIY dollhouse from scratch, but don’t want to spend money on a new eco-friendly dollhouse, your best DIY option is to hunt down a thrift store dollhouse and do a nice remodel. This dollhouse above is an incredibly gorgeous example of what some paint and the right accessories can do to transform an old dollhouse into a modern wonder. 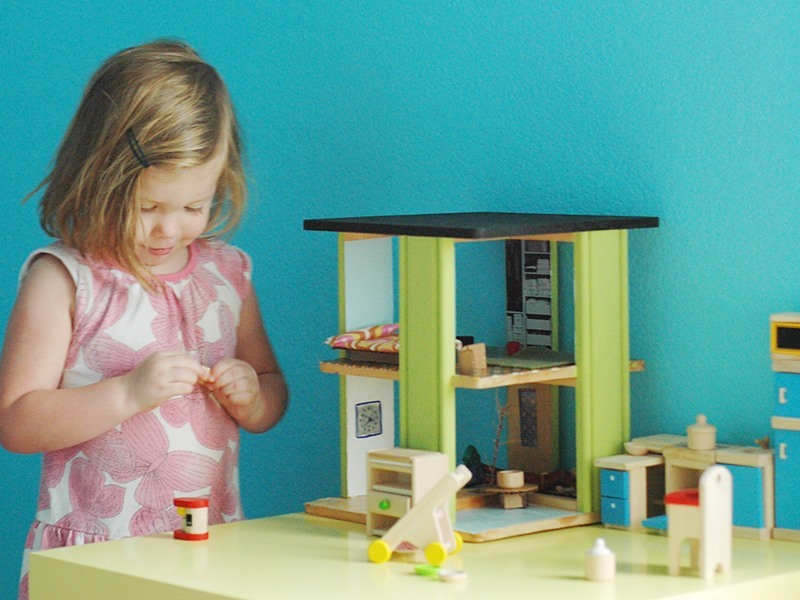 This "off grid" DIY dollhouse takes the cake when it comes to sustainability, cuteness and fun! 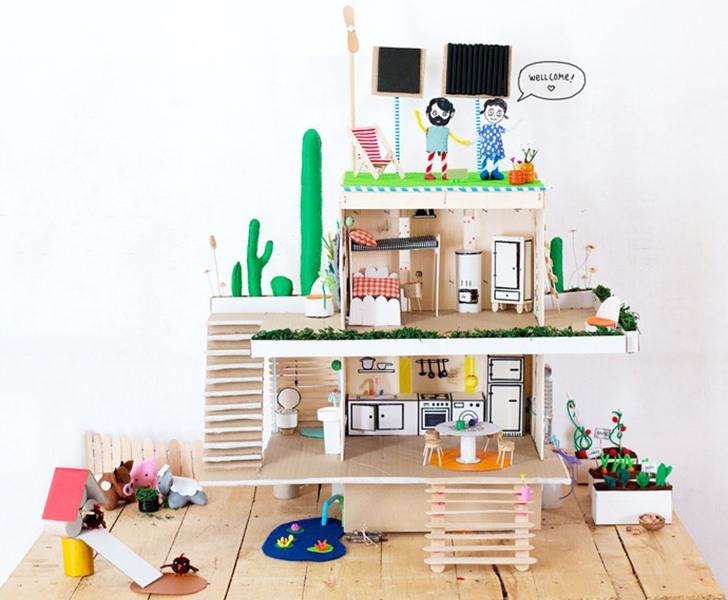 This imaginative dollhouse is made entirely with recycled and scrap materials plus teaches your kids about eco-friendly living via the creative green roof, veggie plot, radiant floor and other eco-qualities the house possesses! 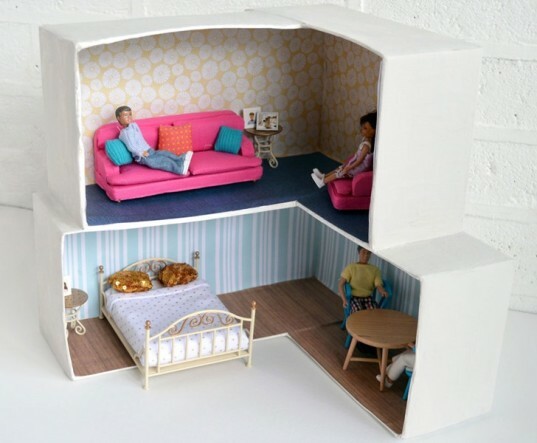 If you're a frequent Inhabitots' reader then this dollhouse might look familiar to you, because it's inspired by the amazing Hase Weiss dollhouses! 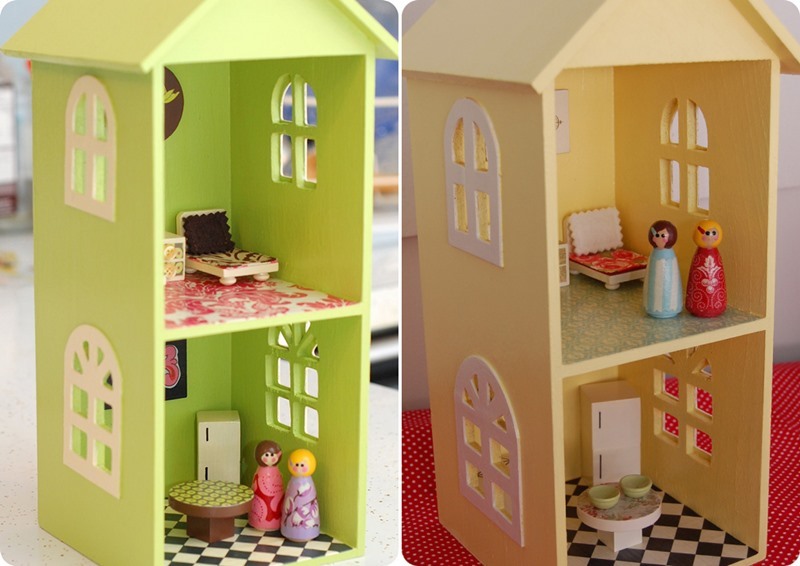 Eva, apparently crafter extraordinaire, constructed her own copycat Hase Weiss dollhouse, and it's amazing! 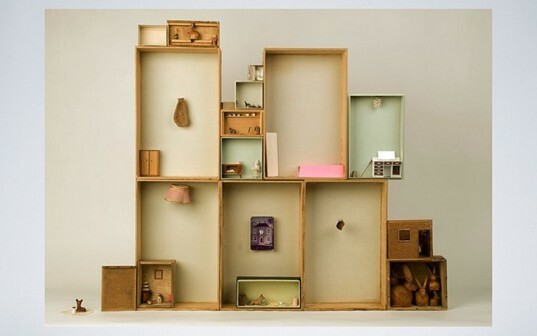 Plus, beyond looking modern and lovely, this whole dollhouse can be reconfigured in dozens of ways and stacks together for easy travel. Now, if you're going to transform a bookshelf into a dollhouse, this one is an excellent example, because while many folks use woodworking tools to add a slanted roof to their bookcase dollhouse, this one simply sticks to a flat roof, cutting the time and skill needed to create this dollhouse. 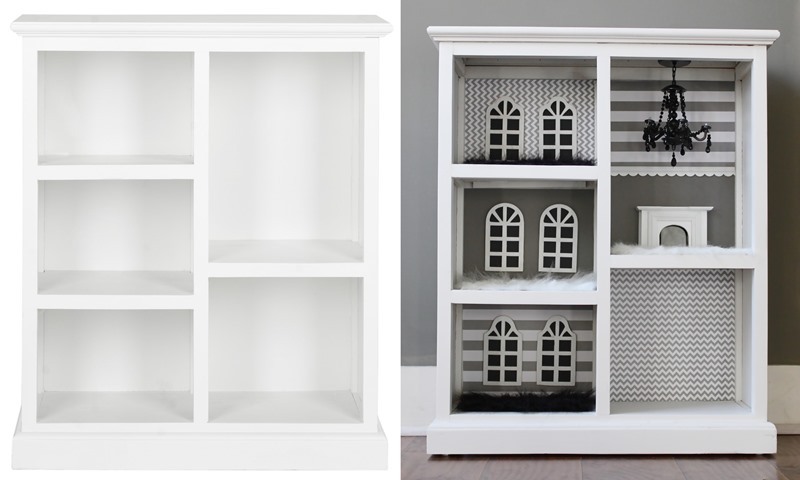 For other examples of bookshelf dollhouses, check out this sweet tutorial or this clever upcycled dollhouse. 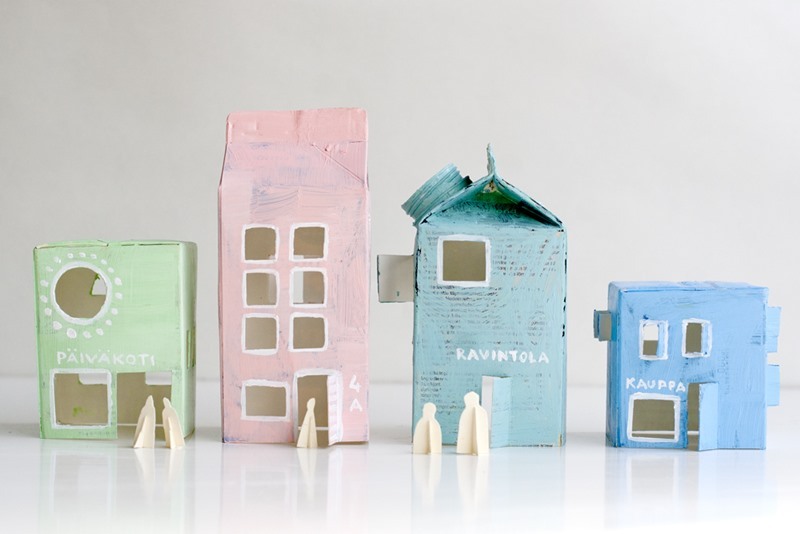 These townhouse-like CD cases turned dollhouses are adorable! According to the tutorial, you can purchase CD shelves at craft stores with windows already included, but if you can't find those, any recycled CD holder will work, just add windows on with paint. 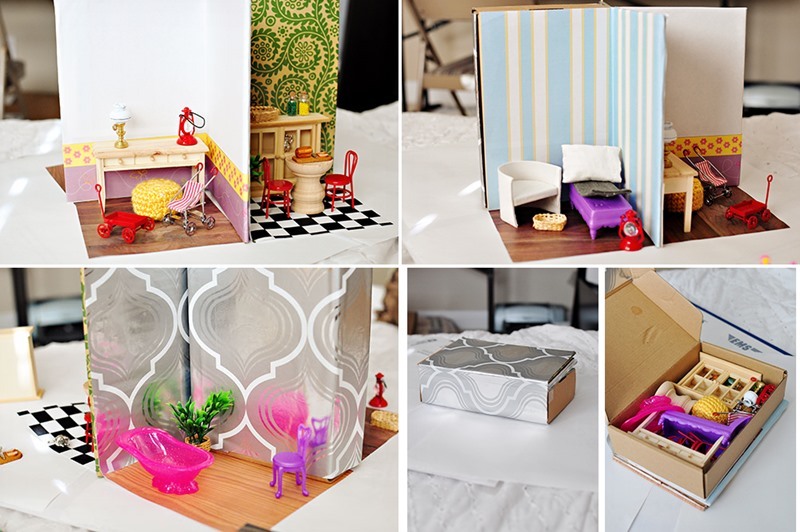 Take your old suitcase, or snag one at a thrift store, and make this super cool - and easy to transport dollhouse. If your little one is all about scary stuff, then this house is for her! 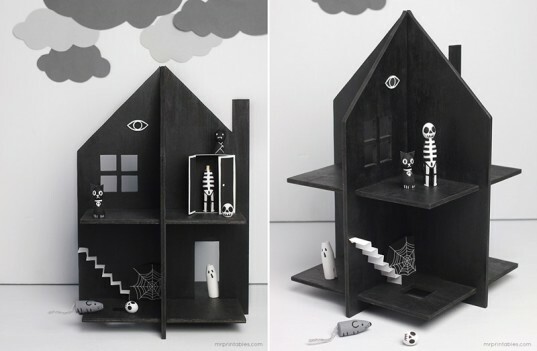 First grab the FREE template from Mr. Printables, and then make this easy spooky dollhouse with wood, paper or cardboard. You also might want to check out Mr. Printables' cool Christmas style dollhouse template. 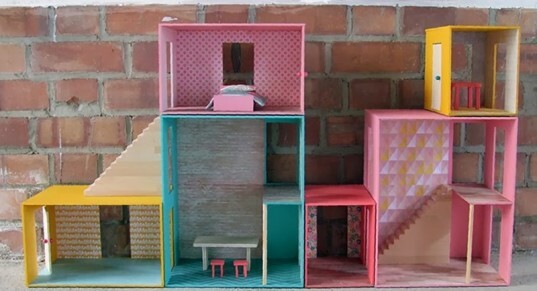 This dollhouse, made with an upcycled CD case is uber adorable and clever. Fashioned after a Plan Toys dollhouse, you seriously can't even tell this used to be a CD holder. If you buy detergent in bottles, then you can wash them well, and upcycle them into the sweetest little fairy doll houses - or combine them to make one large dollhouse structure. This super styling suitcase dollhouse isn't too different than the one earlier in the slideshow, but has the added coolness of a chalkboard exterior, meaning, your child can draw all her favorite exteriors, erase, then draw again whenever the mood hits. 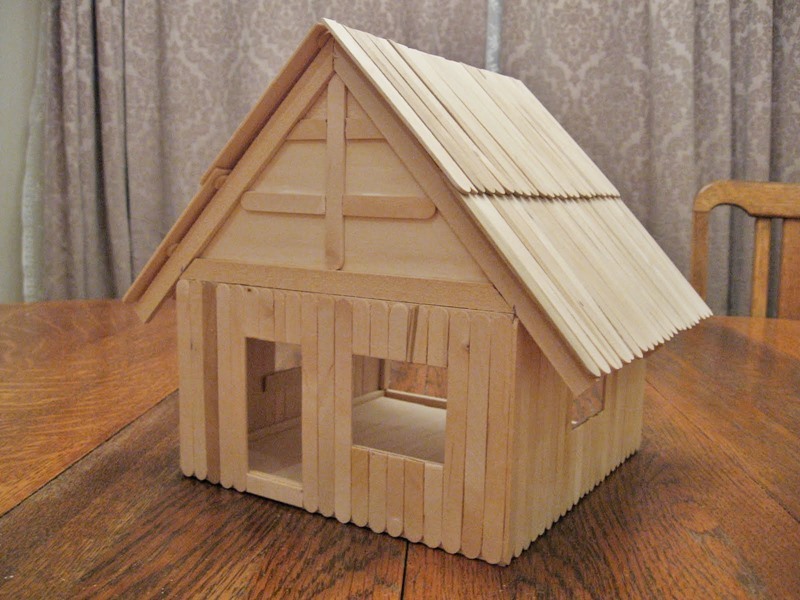 This is one of the more advanced DIY projects in this slideshow, and to make as is, you will need some simple wood tools BUT this is only if you'd like your dollhouse to be modular and not fixed. If you don't have wood tools, this dollhouse is still an awesome example because you can paint some wooden blocks, then glue them together using the images in the tutorial for inspiration and you'll have one really fun and solid dollhouse. If you honestly feel like you don't want to make a DIY dollhouse from scratch, but don't want to spend money on a new eco-friendly dollhouse, your best DIY option is to hunt down a thrift store dollhouse and do a nice remodel. This dollhouse above is an incredibly gorgeous example of what some paint and the right accessories can do to transform an old dollhouse into a modern wonder.